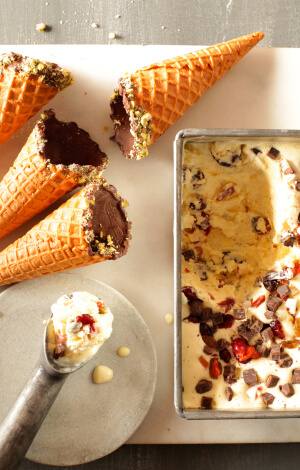 Semi- fredo is the easiest ice cream to make. This one makes a pretty dessert served in slices or simply freeze in an ice-cream tub and scoop into cones for the kids. Place the orange juice and berry zest in a small saucepan and heat gently until the fruit is plump and all the juice absorbed. Set aside until cool. While the berry zest mixture is cooling chop the nougat and whip the cream. Fold the yoghurt and lemon curd into the whipped cream. In a separate bowl use an electric beater to beat the eggs and caster sugar together till very pale, approx 4 minutes – use the timer. Fold in the whipped cream mixture then 2/3 of the chopped nougat, cooled berry zest and chocolate bits. 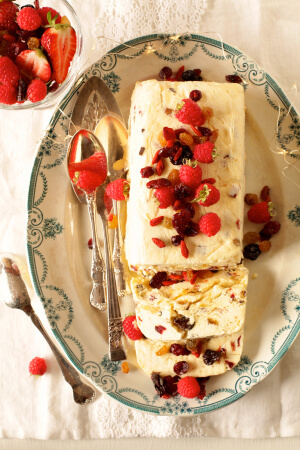 Pour into the container and sprinkle the remaining berry zest, nougat and chocolate over the top. Freeze 6-8 hours or overnight. Melt the chocolate melts in a heatproof bowl over a small saucepan of gently simmering water. When completely melted stir in the Kremelta, this will thin it to a manageable consistency – add a little more if you need it. Spoon some of the melted chocolate melts into a cone then tilt and turn it so the chocolate completely coats the inside. Hold it upside down over the chocolate bowl to allow any excess to run out. Stand upside down on a sheet of foil or baking paper to set. When set, dip the rims of the cones in the chocolate and then in the chopped nuts and leave to set. Cooks tips: Chocolate melts are used here, as un tempered chocolate would develop an unsightly whitish bloom on the surface after a day or so, this won’t occur with chocolate melts.